'Extended Warranty' offers a 'peace of mind' cover to its valuable customers. 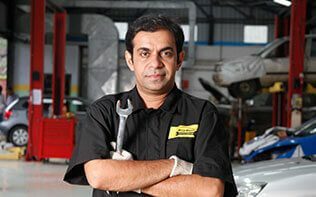 Mahindra First Choice Services is India’s leading chain of multi-brand car service workshops offering wide array of services. We focus on enhancing your driving experience by offering world-class car maintenance services for cars of all makes and models. Our sole mission is “To provide car care services to keep the cars fit and healthy and customers happy and smiling”. With well-equipped car service stations and fully trained mechanics, we provide quality services with excellent packages that are designed to offer you great savings. Our state-of-art workshops are conveniently located in many cities across the country. Now you can book your service online at the nearest Mahindra First Choice Services Workshop.